Hey, y'all! I'm Kristin from School and the City. This is my first post on The Primary Peach. 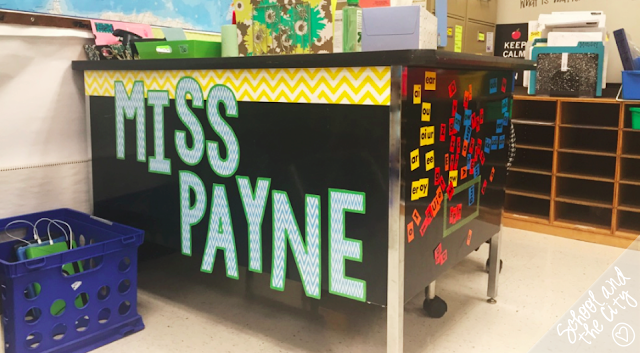 I'm thrilled to be a part of this collaborative blog and am happy to share my new classroom with you! 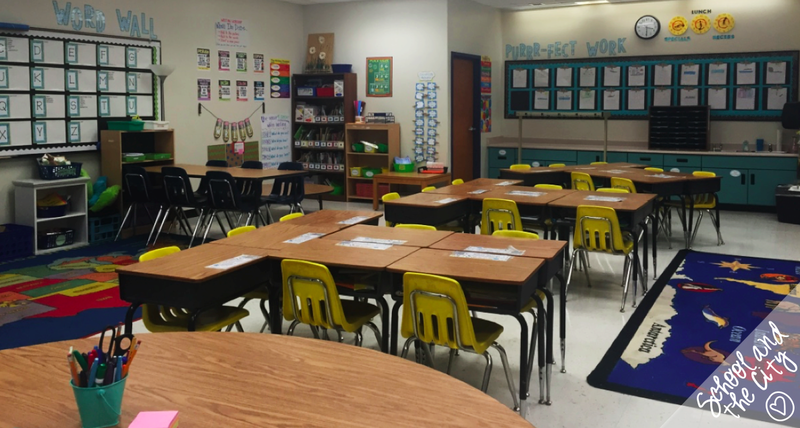 This is my first year in this classroom, so it's definitely not perfect. There are already a lot of things that I plan to change next year, but for now, I'm pretty happy with it. Take a look around! This is the view when you walk in my door. 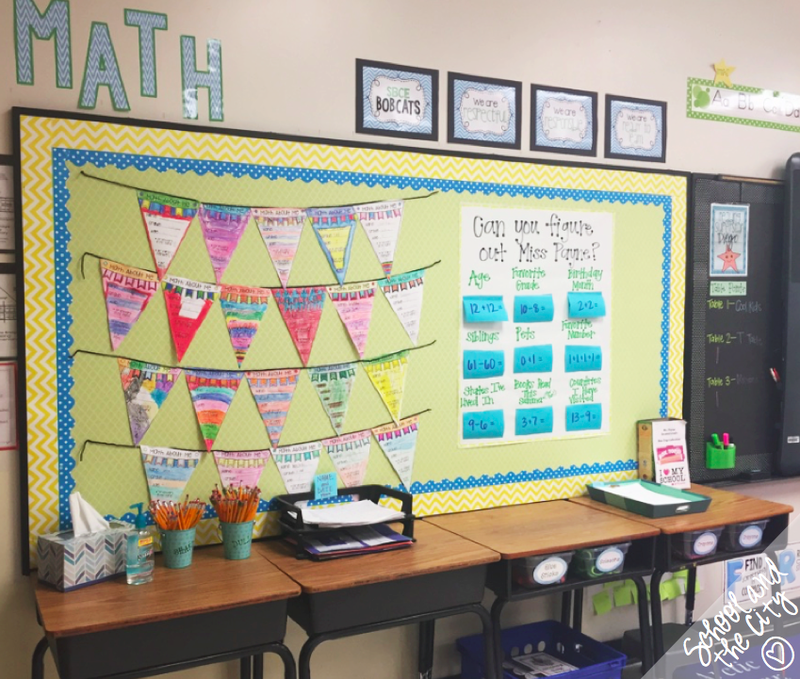 I have tissues, hand sanitizer, pencil cups, turn-in trays, and supplies for my math class like scissors, crayons, and their interactive notebooks. On my chalkboard you can see two of my behavior management strategies that I use, reading superstar and table points. See that rolly cart shoved in the corner by my counter? That's where the backpacks go. It drives me NUTS and I am already plotting about where I am going to hang hooks for next year. The door back there is to my classroom bathroom. I went in there once to hang some cute bathroom reminder signs, but I stay away from that place! I love my writing corner. The round table is a perfect area for a center. 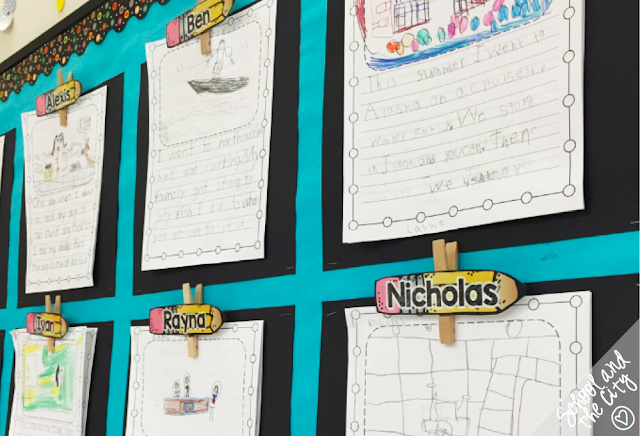 I plan to display some writing strategies or sample writing on the little cork boards. It doubles as the math corner. 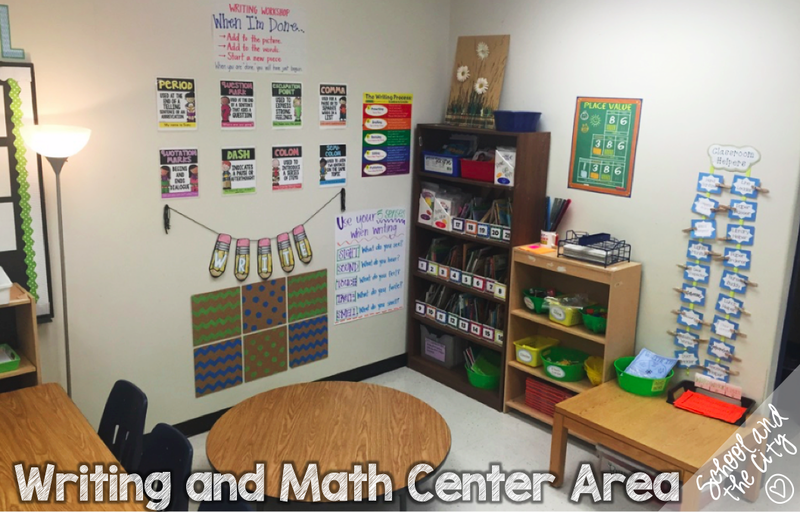 Math tools and stations are located on the short bookshelf, and the table is often used for centers. My reading corner is by far my favorite part of my room! 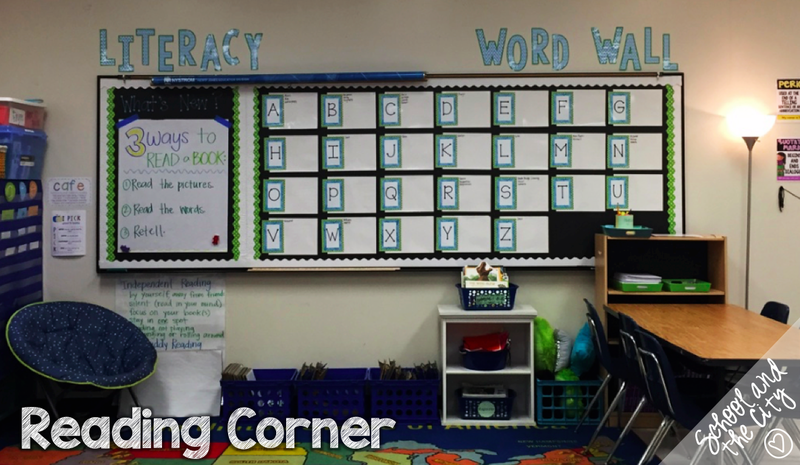 In this area is my classroom library, word wall, and all supplies for whole- and small-group reading instruction. 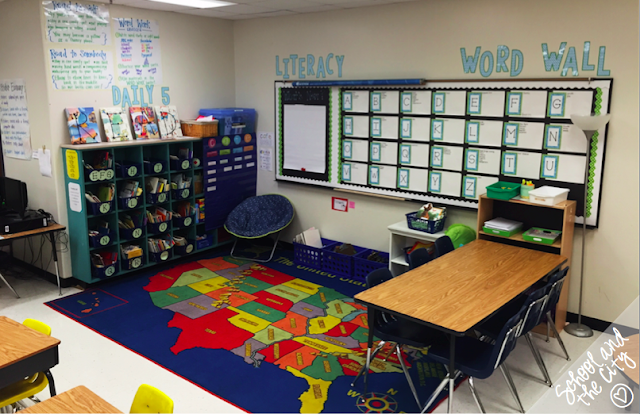 I have crates for fluency phones, whiteboards, clipboards, pillows, and more. 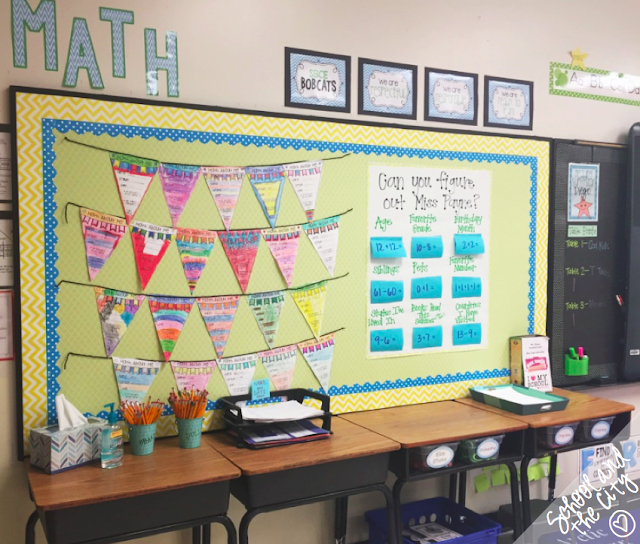 I have not yet introduced all 5 parts of Daily 5, which is why I only have 3 anchor charts hanging. Baby steps, right? I love my word wall. I just laminated construction paper with cute letters. I write on them all year with Expo Vis-a-Vis markers. They do not rub off when kids touch them, but come right off with water at the end of the year. It's great! This bulletin board is going to be where I display my writing for the year. It has been popular topic on Instagram! 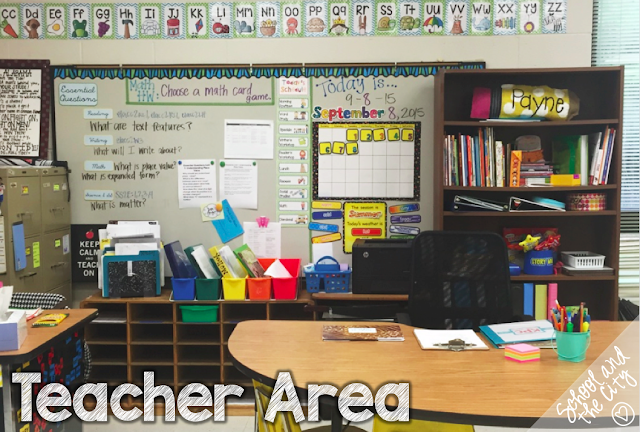 Lastly, here is my teacher area. I love my kidney table, which is where I do most of my small group lessons and individual conferences. The bookshelf behind my table has all of the fun stuff I use for reading small groups like retell wands, whiteboards, recall dice, flashcards, squishy balls, finger flashlights, and more. The colored tubs will eventually be used to organized materials for my guided reading groups, which have not yet been determined. I'm still testing - yuck! The cubbies underneath are what I use to sort and store copies for the week. It's been great! These letters that I used on my desk and to label my bulletin boards are a freebie in my TPT store if you'd like to grab them. Thanks for touring my room! 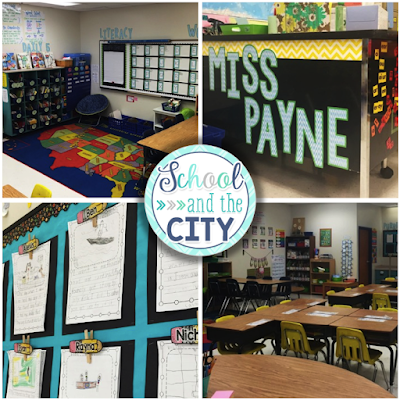 Best of luck to you during your new school year.